The Welsh Assembly Government wants to tackle climate change by actively encouraging the development of renewable energy generation such as wind power, hydro projects, and biomass. The vision for the future of Wales’ renewable energy is detailed in the Welsh Assembly Government’s Environment Strategy, which has set a target of 4 terawatt hours (TWh) of renewable generation by 2010, rising to 7 TWh by 2020. Speaking at the Carbon Trust Annual Conference in Cardiff Bay last November 2007, Ms Davidson told that the Welsh Assembly Government wants to make the most of Wales’ 1,300km of coastline for clean, carbon-free energy generation. Her statement follows earlier suggestions made by leading Welsh scientist Sir John Houghton, the former chairman of the UN’s Intergovernmental Panel on Climate Change, who said that Wales’ high tidal range gave the country the opportunity to be at the global cutting edge of tidal power. Minister Jane Davidson stated that Wales could become a self-sufficient energy producer by harnessing a range of cutting-edge tidal power projects, as well as being the world’s first country to pioneer innovative new tidal lagoon technology. “We may be a small nation but I want to see us being seen as lean, clean and green,” she said. Last year the UK Government announced a feasibility study into the Severn Barrage project for the purpose of tidal power generation. The idea to build a barrage over the Severn estuary linking the Welsh and the English coast is a long-standing proposal dating back from the 19th century. In the past years there have been renewed calls for looking seriously into what would be one of the largest civil engineering constructions in the world. The UK Government’s feasibility study for the Severn Barrage project has been welcomed by the Welsh Assembly, the Welsh First Minister Rhodri Morgan, the Commons Welsh Affairs Select Committee, and the Secretary of State for Wales Peter Hain. 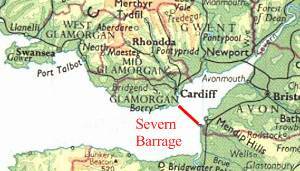 Running from Lavernock Point in the Vale of Glamorgan to Somerset in England, the Severn Barrage could generate 8.6 GW (up to 5% of the UK’s energy needs) and create 40,000 jobs. The project would cost £15bn and would take more than a decade to be built. Besides the Severn Barrage project, Environment Minister Jane Davidson said that the Welsh Assembly Government had already received other tidal power propositions to create tidal lagoons around the Welsh coast and also to build in Wales one of the world’s largest tidal stream power stations. Shortly after the announcement of a feasibility study into the Severn Barrage project it was unveiled that the world’s largest biomass plant is to be built in Port Talbot, South Wales. According to the plan presented in November 2007, the 350 MW wood-chip electricity plant will produce around 70% of the Welsh Assembly’s 2010 renewable electricity target and will provide enough clean electricity to power half the homes in Wales. Wind farms currently take almost 10% of the landscape of Wales, excluding designated of Areas of Outstanding Natural Beauty and National Parks. The Welsh Assembly Government is now eyeing the country’s 1,300 km of coastline, where wind is most effective, as a huge opportunity for carbon-free energy generation. 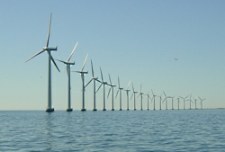 Minister Jane Davidson said "We already have applications for offshore wind farms." The UK Government has said all homes in Great Britain could be powered by offshore wind farms by 2020. Many would like Wales to be seen as clean and green, but there is undoubtedly a big challenge ahead. A legacy of the many heavy industries based in the country, Wales still had the 12th highest carbon emissions in the world in 2004. Assembly Environment Minister Jane Davidson believed the target of achieving an annual 3% reduction in greenhouse emissions by 2011 to be realistic. Speaking at the Carbon Trust Annual Conference in Cardiff Bay last November 2007, Ms Davidson asked Welsh businesses to enter the renewable energy sector, which has the potential to create 7,000 new Welsh jobs by 2011 in industries such as energy generation, recycling, and waste reduction.